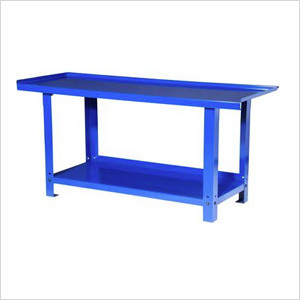 The SPG International 72-Inch heavy duty steel workbench is suitable for use in professional garages, service facilities and industrial applications. The solid steel construction is powdercoated with a high gloss scratch resistant paint. This unit is easy to assemble with minimal nuts and bolts. The back and side roll off panel prevents tools and hardware from rolling off the bench.